Much More Mod is back! 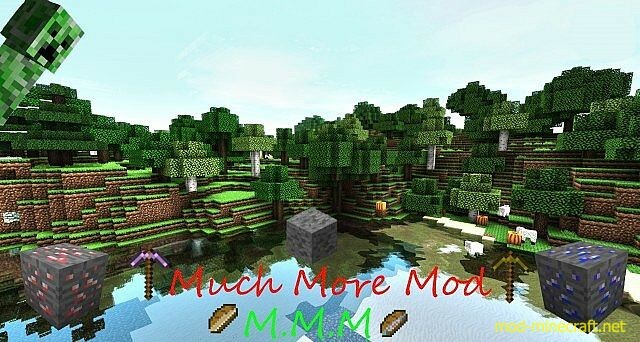 Much More Mod (M.M.M) was out for a while ago but it is now finnaly back. We know the mod is not living up till it’s name yet, but it’s a work in progress, and we promise more is comming. The reason we wanted the mod out now is because we want some feedback. Much More Mod is a mod based on the name. Its a mod where we add things we think Minecraft needs or we think is cool, for example the Gunpowder Ore. Gunpowder Ore is a ore that drops gunpowder, it’s simple and useful. Sapphire pickaxe have a speed of 10F, that is a bit faster then a diamond Pickaxe. The pickaxe can also destroy 1700 before it breakes. To make this pickaxe you use normal recepi, just replace the material with Sapphire. Sapphire Shovel do also have a speed on 10F. And it can dig 1700 blocks before it breakes. To make the Shovel just take a normal recepi, and replace the material with Sapphire. The Sapphire Axe do have the same speed as the Sapphire Pickaxe (10F). and can chop 1700 blocks before it breakes. To make this axe you use normal axe recepi, just replace the material with Sapphire. The Sapphire Sword deals 8 Hp. And you can hit 1700 times with it before it breakes. To make this sword you use normal sword recepi, just replace the material to Sapphire. It’s pathetic that you have to kill a creeper (the green monster that exsplodes) to get a small reward of 1 to 2 gunpowder, when you need 5 gunpowder to make TNT. We wanna get TNT more used in the mines and more crafted. Thats why we made the gunpowder ore. It’s a ore that drops gunpowder and generats almost often as a coal ore.
We also wanted some new types of food. That’s why we added Sandwiches. You may wonder why you should eat Sandwiches instead of, bread or porkchop. The reason is that it gives seven hunger bars, and it will take longer time before you will start starving again. We wanted to make something out of gold, and obsidian because they are both pretty useless. So we made Gobsidian. Gobsidian can be used to craft very strong tools. to make tools out of Gobsidian look at recepis bellow. The Gobsidian Pickaxe have a mining speed of 9F. The special thing about this tool is that it is a infinity pickaxe, so if you dont loose it you can have it for ever, this is really good if you want to enchant it. to craft it look at the picture over this spoiler. The shovel do also have a speed of 9F. The shovel is infinity aswell. If you want to craft this, just look at the picture over this spoiler. The Gobsidian Axe have a chopping speed of 9F. The axe also last forever, and is crafted by the recepi over this spoiler. The Gobsidian Sword is really strong because it deals 8 hp, and it wont break. to make the sword, just look at picture over this spoiler.